This product is sold by MigaStone. The support is provided by this vendor directly. You will get his support access in the purchase receipt email. 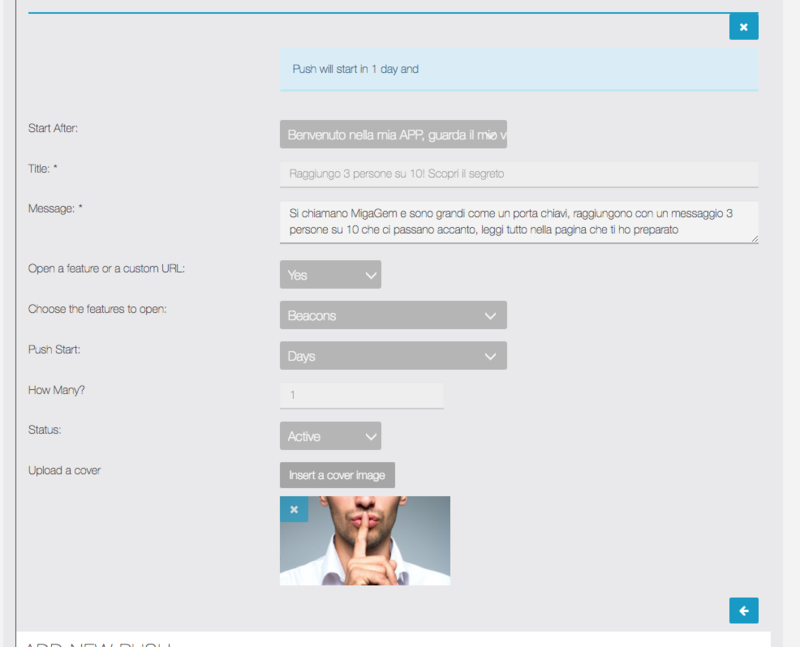 You will get within 1 working day after the purchase a LICENSE CODE in email to activate your module in the ADMIN backoffice >> Manage >> Modules section. The license include FULL upgrades and support of this module. Migafunnel is a module that allows to send automatic pushes when a specific event/trigger is happening. It is a very powerful tool to engage customers and improve the APP experience. 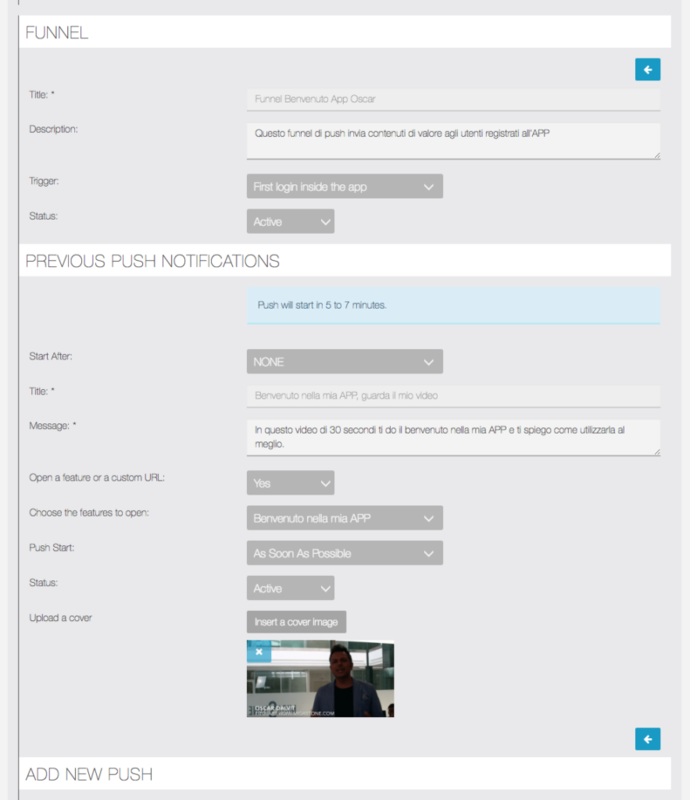 You can delivery contents periodically to customers based on a Funnel of Push Notifications. When one of these events/trigger is happening we are able to start a FUNNEL OF PUSH, a sequence of unlimited number of pushes scheduled to be sent automatically to the user. Every push has a delay of hours or days from the previously push selected. For example is it possible to setup a welcome push notification immediately after the registration of a new user inside the App and schedule every 7 days an automatic push sent to the user for an entire year!! 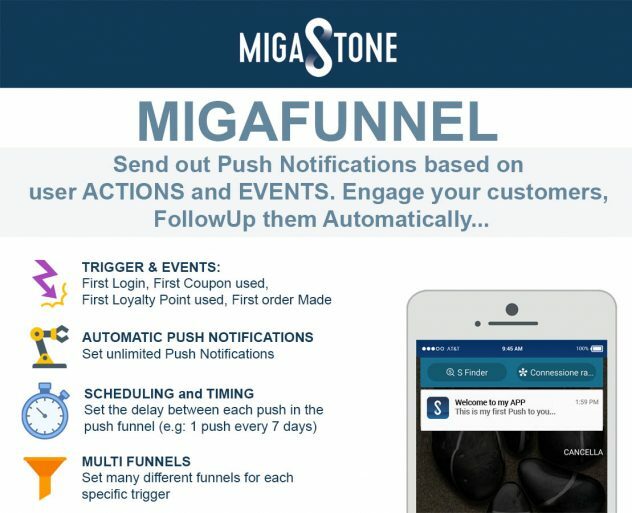 When you activate Migafunnel the function add to the menu of your APP a page that has the target to allow the final user of the APP to UNSUBSCRIBE from the automatic push service. Here in the screenshot an example. The first thing to do is click on SETTING and modify the DESCRIPTION of this page. 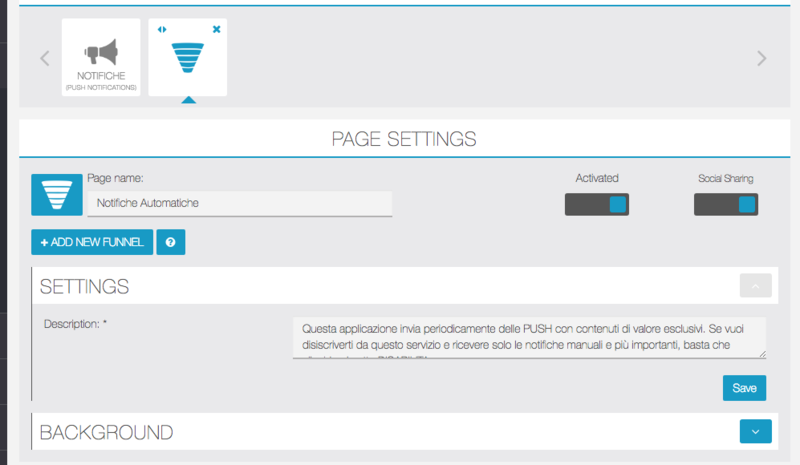 This description should explain the user that the APP he downloaded has an automatic push funnel, if the user want can disable any automatic push by clicking the option in the page. 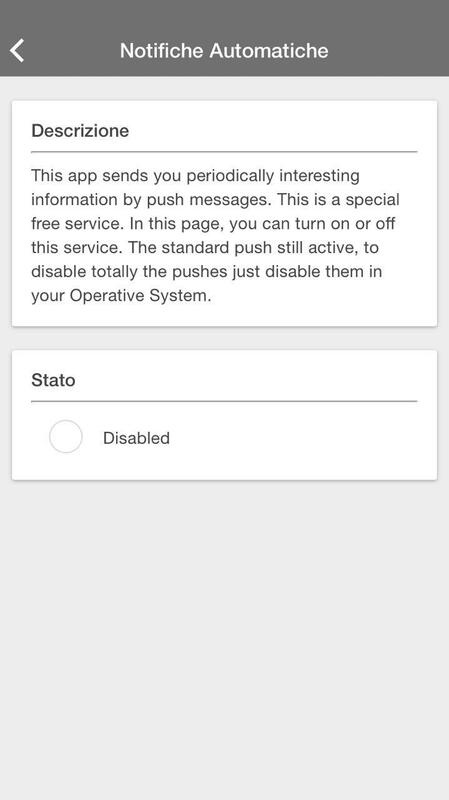 He will disable only the automatic push but the standard push notification will remain active. 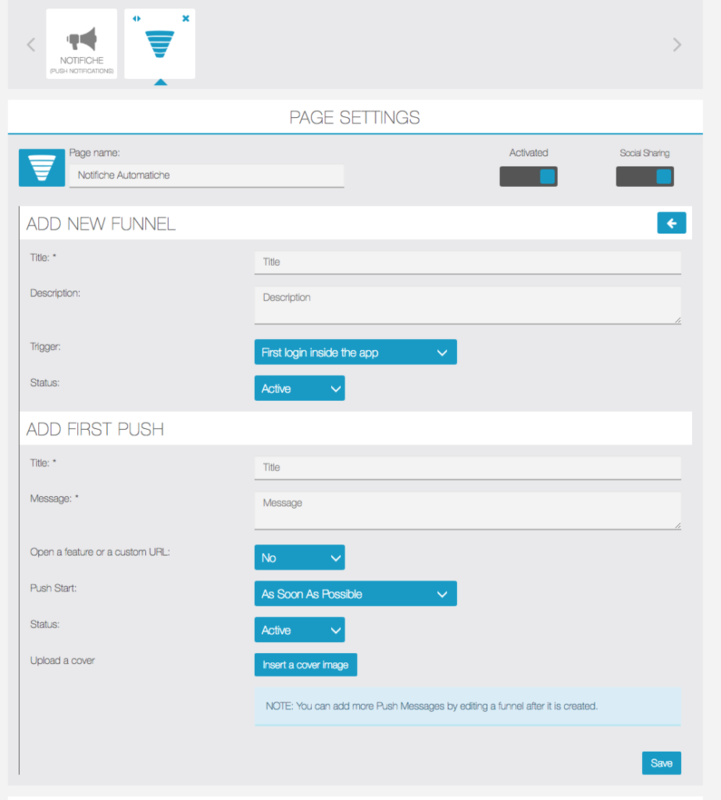 After you set the correct description, you are able to select ADD NEW FUNNEL as the picture on point 1 above. DESCRIPTION, is a small description that allow you to remember what is doing this funnel. TRIGGER, this is the event WHEN the funnel should start, select the one you need from the drop menu. 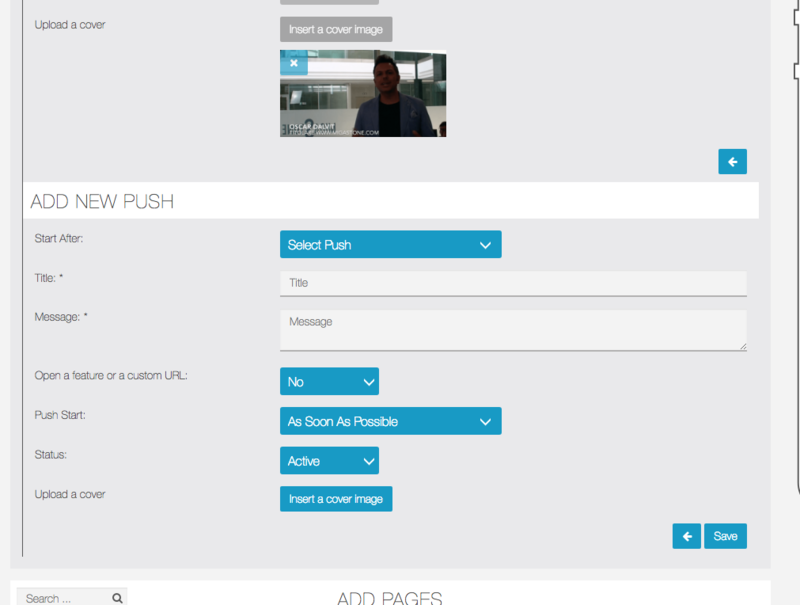 OPEN A FEATURE or A CUSTOM URL, this option allows to bring the user to an URL or a specific page of your APP by clicking the button VISIT of your PUSH notification. IMAGE, you can upload an image that is showed with the push. Now you can start to add more pushes, the concept is that every push is linked to a previously one with a “delay” set. You can choose any of the previously push as a trigger. As you can see in the next screenshot, START AFTER is a menu that allows to select one of the previously push available. In this screenshot you see only one push available, the first one. All the push notifications scheduled per user are saved in the principal PUSH NOTIFICATION history of push that you normally find in the PUSH NOTIFICATION feature of your APP. When an user UNSUBSCRIBE from the push notification service, all the pushes scheduled to reach this user are automatically deleted. Every time a PUSH is deleted from a funnel all the scheduled pushes related this specific push are deleted. You can delete a push funnel when inside it there is the FIRST PUSH only, so if you want to delete a funnel first delete all the other push stored.